In this research area, we study the effects on health behaviour of digital media, social media and mobile apps. eHealth and Technology concerns the use of digital media such as the Internet, mobile apps, social media, or 3d virtual worlds that have the potential to influence health and to aid health communication strategies by crossing boundaries of time and location, and be tailored to patients’ individual needs. 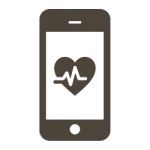 Despite its potential, little is known currently about how eHealth can contribute to effective health communication and eventually health quality. We study to which extent and how (personalised) digital media can advance a healthy lifestyle. In addition, we investigate how (personalised) ICT innovations can be used to empower patients before their consultations, to support health care professionals and patients during their consultations and to support patients after their consultations to adhere to treatment recommendations and life style advices.